Alisha Wormsley didn’t intend her work of billboard art to be about gentrification. But her message reading “There Are Black People in the Future,” posted in big letters atop a building in the center of East Liberty, has become just that. Wormsley, a self-professed science-fiction nerd, meant the message as an ironic comment on how seldom our culture’s visions of the future include people of color. But a landlord’s controversial decision to order the message’s removal last month sparked first a social-media backlash, and then Wednesday night’s public forum, entitled Art and Community Values: A Kelly-Strayhorn Theater Conversation. About 150 people came to the venue, located just a block from the two-story building formerly topped by Wormsley’s pithy message; many held signs reading “There Are Black People in the Future.” The hour-long event began with presentations by Wormsley and Jon Rubin, the Carnegie Mellon University art professor who’s been using portions of the building for various cutting-edge art projects for a decade. After the presentations, and against a backdrop of rapid redevelopment and rising housing costs in the historically black neighborhood, the several impassioned attendees who spoke were less concerned with Wormsley's artistic intentions than about the message sent by those whose complaints led the landlord, We Do Property, to order the billboard’s removal. 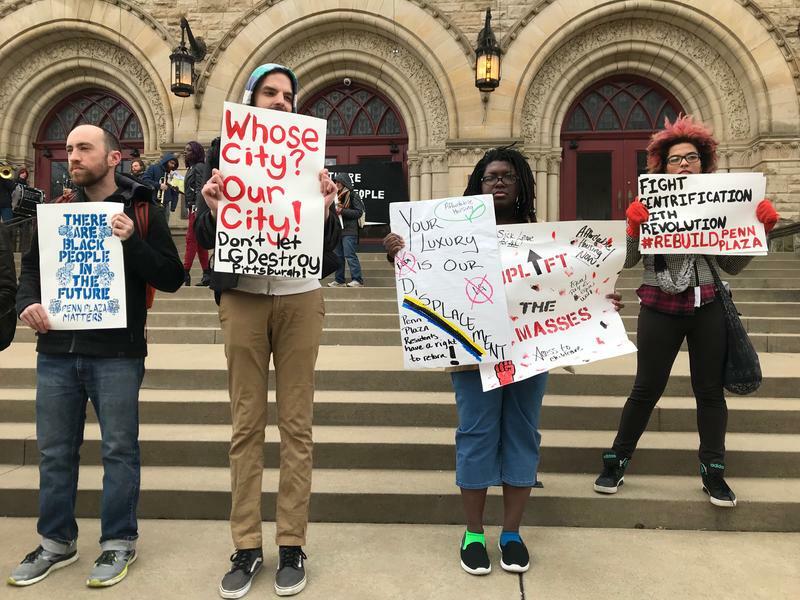 “I do think that what happened to your sign is indicative of the larger trend of erasure of culture and also an attempted erasure of certain bodies, specifically bodies of color, from the East Liberty narrative,” said neighborhood resident Ambrose Curtis. 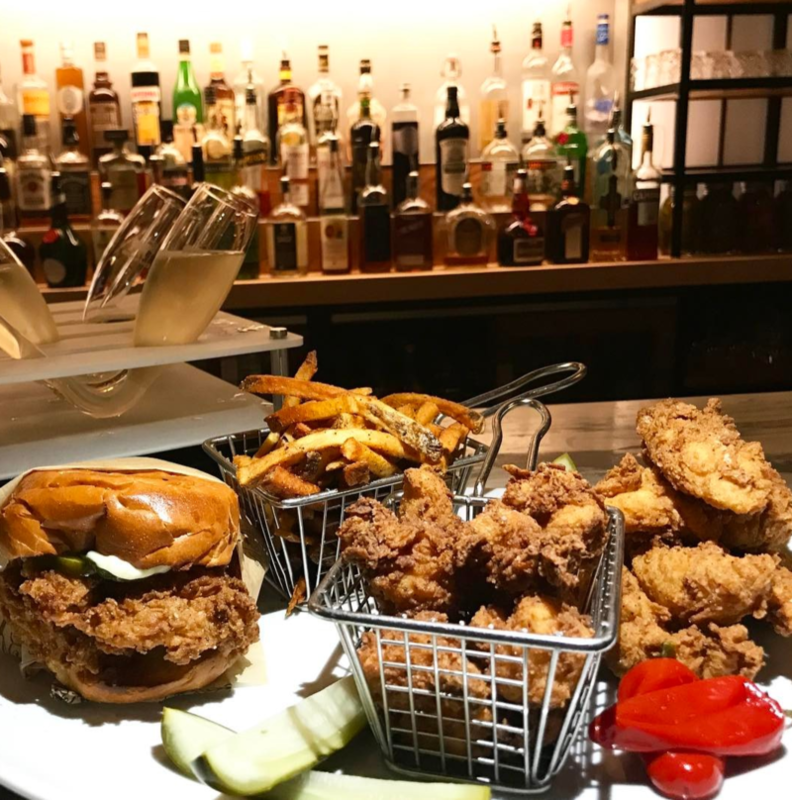 “This conversation is happening, and it continues to happen, because blackness is considered a threat,” said Damon Young, a nationally known blogger who grew up in East Liberty. Prominent Pittsburgh-based artist Vanessa German, who lives in Homewood, has been frequenting East Liberty’s business district for years, but she said, “I don’t feel welcome here.” She said she had been verbally harassed for simply parking her car in the neighborhood. German was echoed by Kelly-Strayhorn executive director Janera Solomon, who organized the public forum. “There are places that I walk into on that block where people look at me like I’m a foreigner” -- even though she’s worked in the neighborhood for years, she said from the stage, where she served as moderator. The billboard was the latest in a series Rubin calls The Last Billboard, which had over some eight years included messages from the explicitly political (“Capitalism is Over if you Want It”) to the poetic (“The Whole Town is Sleeping”), by a variety of local and national artists. Wormsley’s “There Are Black People” message went up in early March but was removed three weeks later after the landlord, We Do Property, cited complaints from the community that the message was confusing, divisive and offensive. The billboard’s removal was announced April 3 in an online post by Rubin. Public outcry followed, with critics charging We Do with censorship and racism. On April 6, Picker announced that the sign could be returned because there were more people "saddened by its removal" than offended by the sign itself. 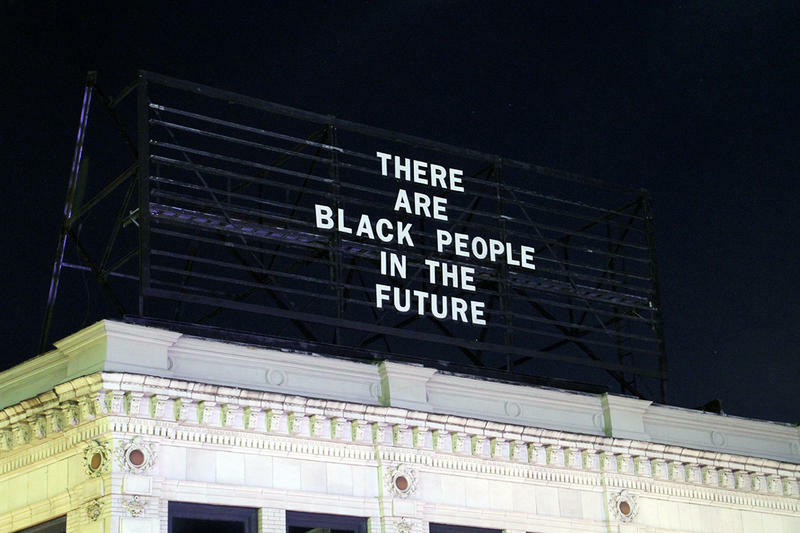 Subsequently, however, the Penn Plaza Support and Action Coalition, an activist group, adopted “There Are Black People in the Future” as a rallying cry, and on April 13 held a rally in support of Wormsley’s billboard. The New Pittsburgh Courier newspaper reported that the group had targeted ELDI for allegedly abetting gentrification over the years. On Wednesday, Solomon said that in order to keep the focus on the artwork, she had not invited anyone from We Do Property or ELDI to speak at the forum, though they were welcome to attend. And in fact, ELDI board member Pam Collier did speak. She acknowledged that racism is rampant in Pittsburgh, but said that, due in part to ELDI’s efforts, one-third of the neighborhood’s housing stock is permanently affordable. She also emphasized that change in neighborhoods is inevitable. The forum concluded without any specific call to action. But Solomon said she hoped some good would come of the whole affair. Also, stay tuned: Though Picker granted permission to restore the billboard, as of Wednesday, Wormsley and Rubin had not done so. Asked at the forum whether the message would return, the curator said only that he and artist Wormsley are “working on something” to put in its place. The audience applauded. At a charged public meeting Monday night, residents decried a plan to build retail and office space at the former Penn Plaza site in East Liberty, once home to more than 200 low-income and elderly people. That work of billboard art in East Liberty that was taken down last week can go back up, according to a statement issued this morning by the landlord of the building the billboard stands on. Last week’s mass shooting in Wilkinsburg provoked strong reactions within the neighborhood, across the city and in national media. Writer and former Wilkinsburg High School teacher Damon Young offered one of them on his blog, Very Smart Brothas. 90.5 WESA’s Josh Raulerson asked Young to elaborate.